Winter is perhaps the most severe of the seasons (however, depending on where you are, some will argue summer often competes for first place). Nevertheless, there’s something romantic and peaceful about a snowfall, a quiet crystal night and frosty windows, that continues to capture the imagination of humans and influence their behavior. 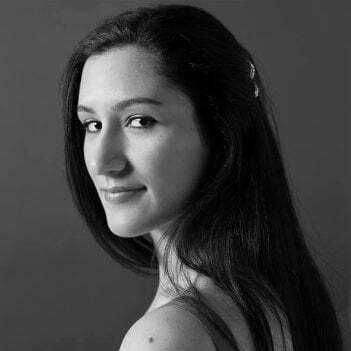 While it is true that the way we react to our surroundings is in fact determined by our experiences, you can still make the most of the frosty season no matter how icy the plunging temperatures get this year. 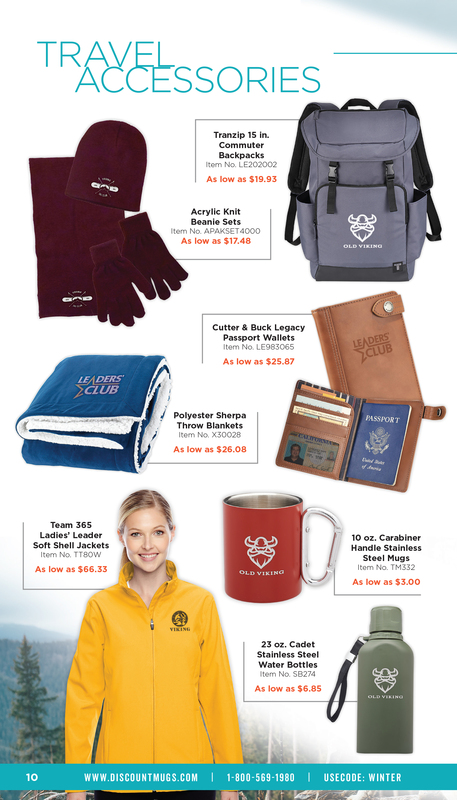 Simply put your logo on our winter-related items for useful finds your customers will appreciate. No, a cat didn’t run across my keyboard. Chances are the starting of the year will be rough on your business. The holiday season just ended, and while it was a time to celebrate and spend time with loved ones, many will find themselves retreating to the warmth of their homes to try and spend the least possible amount of time outside. This can be intimidating for business owners. Perhaps you’ve been trying to close on a deal for months now and your leads are nowhere to be found. You might be thinking a meaningful e-mail might just do the trick, but do you really want to take that risk? Possibly, the best way to maintain a close connection with your customers is by presenting them with a little extra something they weren’t expecting. 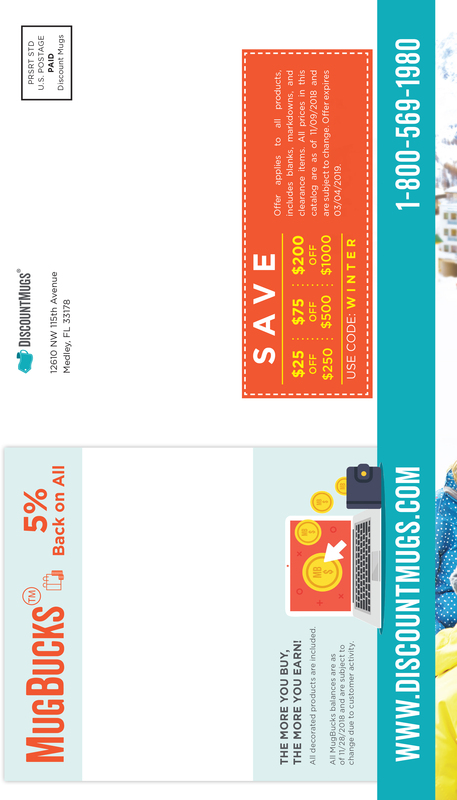 Look inside DiscountMugs 2019 Winter Catalog and send meaningful gifts instead. People are always ready for gifts, wink wink. I’m sure I don’t need to list the reasons why dressing warm is a must in the winter. However, I will tell you how wearable promotional items can be both functional and a marketing dream come true. The perfect addition to a quiet moment outdoors, our custom softshell jackets, wool caps, scarves, beanies and gloves are epic tools your brand can stand behind. Promotional apparel is only as valuable as many times as it gets worn, and this season you must think outside the printed shirts. Although they do deserve their own season in the advertising spotlight, your logo will be hidden beneath layers keeping your audience warm. 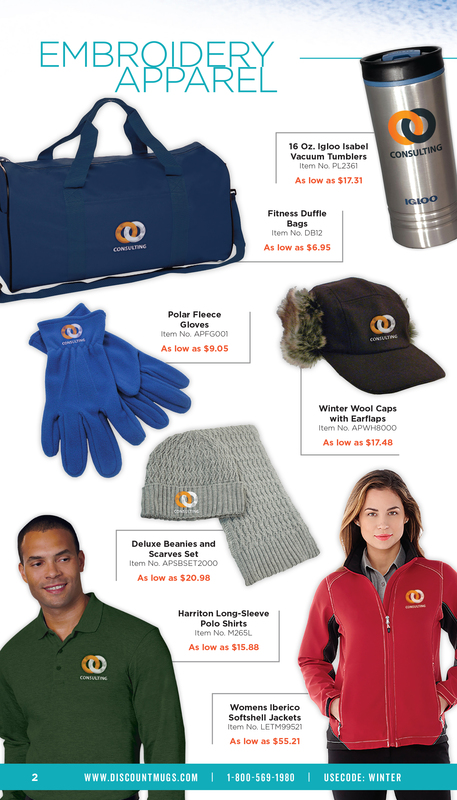 Winter promotional items will keep your logo quite visible and give you the perfect excuse to visit your leads. Browse our winter apparel items now to stay ahead of the competition. 1/2 cup of sugar, 1/4 cup of baking cocoa, a dash of salt, 1/3 cup of hot water, 4 cups of milk, 3/4 teaspoon of vanilla extract, miniature marshmallows, sweetened whipped cream and cinnamon sticks. The signature winter drink is likely to be making a sweep around coffee shops everywhere, and seasonal drinkware items are a great way to engage your audience. 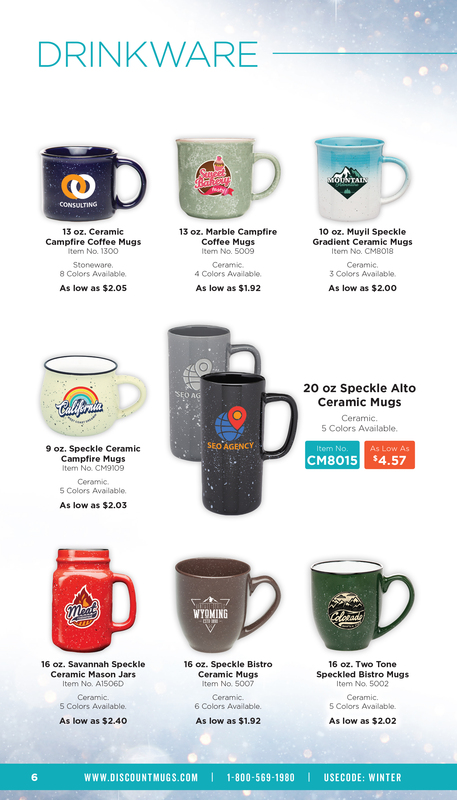 Whether you want to make them available for sales at your own store, or are thinking of giving them away to employees as a gesture of faith for the year ahead, custom ceramic mugs, stainless steel travel mugs and tumblers can help you make the vision come alive. Order personalized with your logo and insert a paper copy of the recipe for a unique finishing touch. Although some of us may be experiencing the aftereffects of a holidays hangover, many others on the other hand simply couldn’t be relieved of their duties and postponed their travels till after the new year. It’s common to hear of families reuniting during the early months of the year and your business can benefit from reaching such specific a niche. Some items to think about include passport wallets, luggage tags, laptop backpacks, travel pouches and portable power banks. 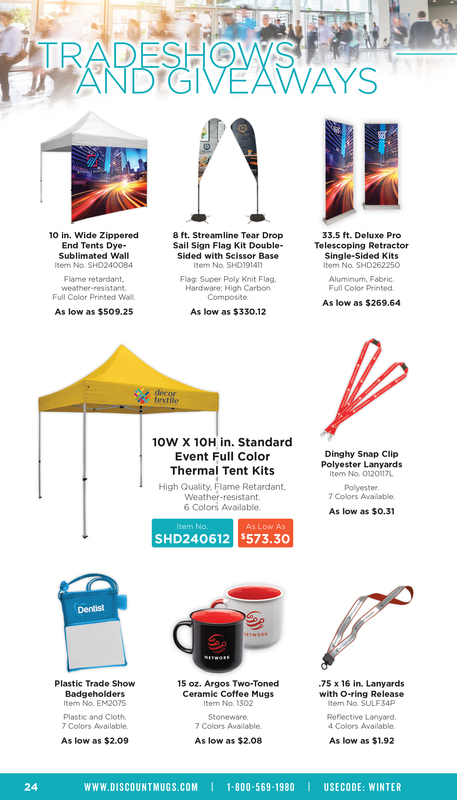 After all the overindulgence of the holiday season, your audience will definitely appreciate promotional items they can put to use immediately and help them save some dollars. Yes, winter is also the first wave of the trade show season and we all know that exhibiting can be a very effective marketing strategy. These events will take considerable amounts of efforts and resources so making the most out of them should be your priority. Promotional items like tote bags, pens, water bottles and notebooks are excellent choices since your customers will end up using them well after exhibition day. However, drawing attention to your booth is key to the success of your event and some exhibitors often forget to plan for a killer booth. To be honest, boring trade show booths won’t attract any visitors. However, custom tents with personalized backdrops, thermal tents to keep visitors safe from inclement weather, printed kits and flags are all tools you can use to make your booth stand out. Just remember to take function and appearance into consideration – the combination will help your displays get more attention. 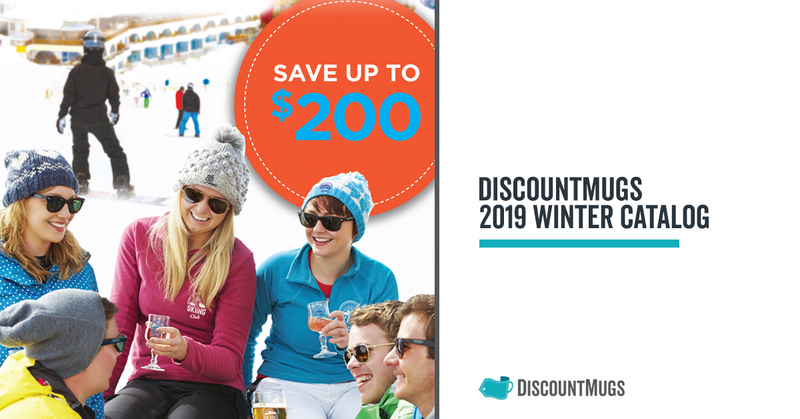 The best part about our 2019 Winter Catalog is all the savings and deals we’ve combined in one place for you. Whether you own a restaurant, manage a hotel, are looking for ways to grow a line of regulars at your bar, or need innovative promotional products to elevate your business presence in the workplace and the community, you can trust us to bring you the latest in customizable items. 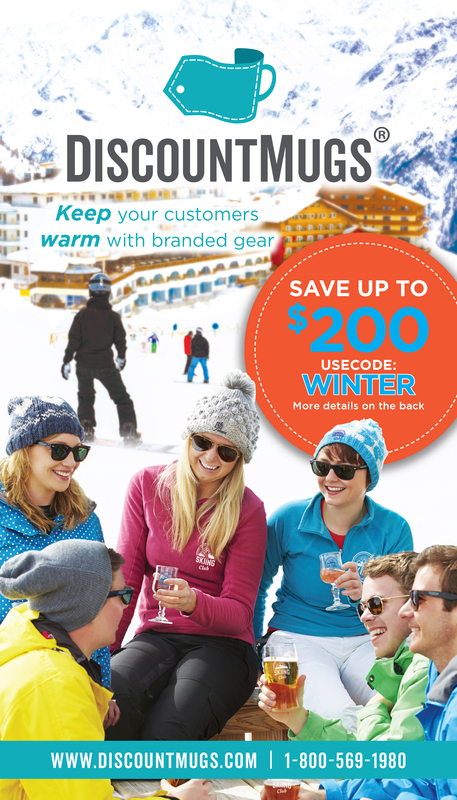 Winter season is a great time to work on your promotions. Not only is it the beginning of the year and the perfect time to attract new leads, but also the best of times to solidify the relationship you worked through the year just passed. Don’t forget to take a look inside and browse the many different and unique items that made this season’s picks. Our product specialists have worked hard to bring you inspiring promotional items to make all the difference this year. As always, our goal is to help you create lasting impressions that truly impact the growth of your business. Let us know in the comments below what you’d like to see on upcoming editions, and how we can better help you achieve your advertising goals.